Hassan Ahmed from Alhomaidat School, Esna, Luxor: I used to pack my books using a rubber band, now I am so happy to have a bag. With the new bags, our children are encouraged and motivated to study; meanwhile they benefit from the awareness material. 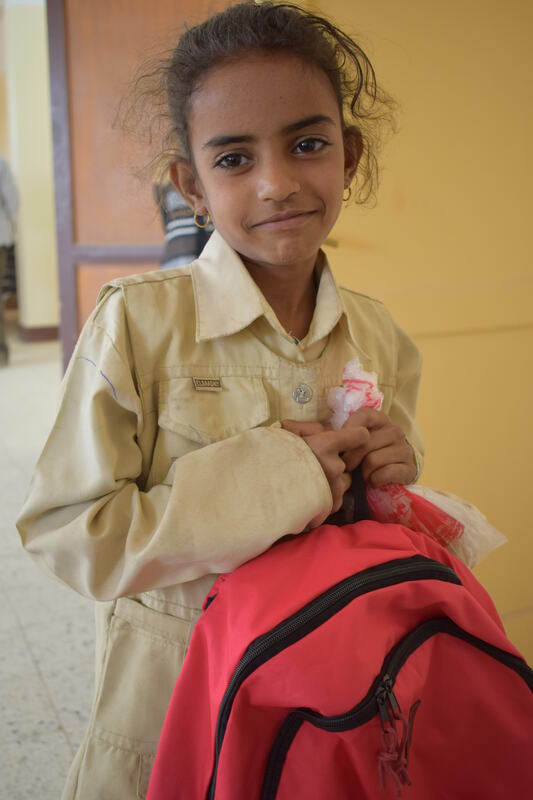 For the second consecutive year, AFNCI pursues its schoolbags campaign in Aswan and Luxor, where it handed out bags to students of 28 schools in the two governorates during the last year. To fulfill its promise, the Association increased the number of schools to 83 in the two governorates. It is noteworthy that within the next step the Association will pursue its campaign in Aldaqahleya and Alqaliobeya governorates, God willing. These efforts are part of AFNCI’s commitment to support initiative that contribute to community development, healthcare enhancement, education, institutional philanthropy and fighting the cancer of poverty, ignorance and disease. Your support will contribute to protecting new generations from diseases and give them hope for a bright future. Direct your donation to account number 666 666 in all Egyptian banks and post offices, or send a 5 pound message to 9663.